Sure, I've been writing my wares around the internet for more than a decade now, on various sites of both my own doing and other people's places, and have had my way on several now defunct blogs of my own, but this here is the finishing up of my first year right here at All Things Kevyn, the hub of ...well, the hub of all things me. Yup. Be it my writings on cinema, comic books, music, TV, or whatever pop cultural thing is on my mind, my reviews and top tens for the other online places where I happen to rest my laurel cudgel, or any of the other doo-dads I dabble in (my web comics, my TV alt history stuff, my selfie patrol Instagram doo-hickeys), they can all be found right here at All Things Kevyn. So there! 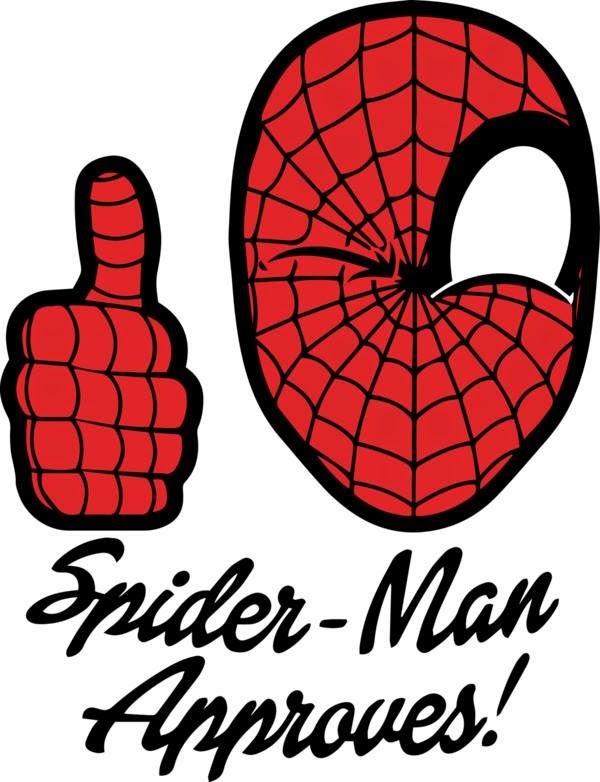 And hey, apparently Spider-Man approves. But I digress. It's been a fun ride lo this past year. Before All Things Kevyn came around (and I am still beyond thrilled with myself for coming up with that title) my writing was mostly stuck in the rut of film review and/or critique. Not that there is anything wrong with such a thing, as far as entertainment goes, cinema is my number one, go-to media, but it has been fun spreading my writing wings out into television and comic books and strips, and even into music, though the latter is my weakest side I think. I've also been enjoying coming up with all my top ten lists, from the 10 Best Mothers to the 10 Sexiest Muppets to the 10 Best Bobbys to the 10 Baddest Eye-Patch Wearin' Mofos! Yeah, they're fun. And now here we are a year later, and still goin' strong. I've had guest blog posts and I've taken part in a slew of blogathons. I was part of the annual April A to Z Challenge, and will be again this coming April. Lotsa good stuff. And ya know what? Wouldn't it be nice if all of these aforementioned posts could be found somewhat easily and all in one place? Yeah, it would. It really really would. Which brings us to the following link. So there! No needless wandering around the blog to find whatchya want. It's all there in one oh so convenient place. Even all my past writings as well. But once again, I digress. I've now spoken of the past, but what of the future, kids? What of the future? Well, let me tall ya. The future here at All Things Kevyn will include more strange and unusual top ten lists, as well as the usual suspects of film and TV reviews, comic book reviews over at Comic Spectrum, more and more blogathons, and lots of other stuff too. Regular series' such as The Alphabet Game, Comic Stripping, People Who Need to be Punched in the Face, and The 11 Question Interview, will all be moving forward into Year Two. But these regular features will have brand spankin' new company joining them soon. Among these new features is a new guest blogger thang tentatively title Zoomin' wit Zuky. Yeah okay, that title may very well change before it debuts in January, but hey, that's where it stands right now For all those old school readers of mine (and you know who you are), there may also be a return of a newly revamped Top 5 Project comin' your way in Year Two. There are a few other wigglies in the works right now, but they are still in the confidential planning stages, so you'll have to wait on them. And, to spread my future ramblings beyond just the mere blogosphere, I do hope to be finishing my book sometime in the new year (my book on the forgotten TV shows of the past), and in turn, hoping to have it published sometime over the Summer of 2015. So there's always that of which to look forward. And that's about it...for now. But before I go, I do want to give a shout out to all my loyal readers. All those faithful readers and true believers that make All Things Kevyn the place where all the cool kids wanna hang out. Like they say, it's all about the fans, and I appreciate all my great fans out there in the cyberworld. And here's to hopin' you'll keep on keepin' on. That's it gang. See ya 'round the web. To close out, and to give a hint to one of those aforementioned confidential plans, here is a photo of Rita Hayworth playing ping pong. Have fun. Congratulations on your one year of misogynistic pandering. Ha, just kidding. Sort of. Love you, and hope you go onto the bigger and better things you so desire. Nice shot of Ms. Hayworth. Thanx everybody!! Year Two is upon us!! And I think I may start closing out all my posts with a picture of Rita Hayworth. Seriously. I just might do that. See ya'll 'round the web. Again, congrats on your one year anniversary. Here's to a fabulous 2nd year! Thanx G.B.! I sound like I'm in a 1`930's movie when I say that. Gotta get that story G.B.!! Seriously though, thanx on the congrats.